Unlocking your door has never been easier. Choose from either PIN code operation or simply unlock with any of the Yale RF-ID access soluitons, available in card, tag and sticker formats. For the super ech savvy user, Yale's Monoblok Smart Door Lock can even be further integrated into most Zigbee and Z-Wave based home automation systems with an optional communictions module. 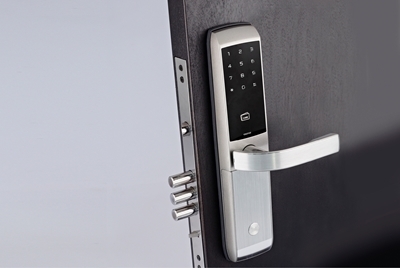 This Smart Digital Door Lock is not only the smarter way to protect your home, but is also ideal for Guest Houses and even light commerical applications, Powered by 4 x AA batteries, the Yale Monoblok Smart Door Lock can be installed on wooden and steel doors. The robust touch screen keypad and voice-guided prompts ensure an ultra-modern and sophisticated user experience. Low battery warning with emergency battery connection, visitor and one-time PIN codes, and keypad lockout for consecutive incorrect PIN code attempts completed, means that this Smart Door Lock is the perfect solution for homes, Guest Houses and light commercial applications.